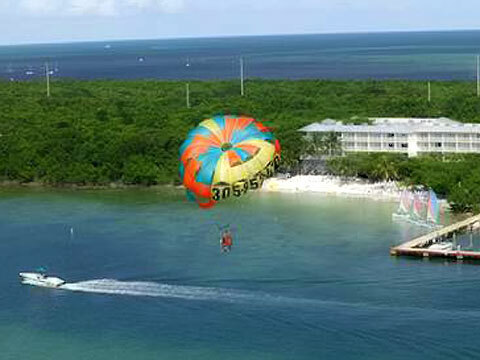 CARIBBEAN WATERSPORTS would like to extend you a warm welcome to the Fabulous Florida Keys. Our islands are unique, our climate exceptional, and our ability to relax and have fun renowned! Take this tropical paradise and combine it with Caribbean Watersports' 24 years experience, and you have the makings of a truly remarkable vacation. Whether you are sailing in a tropical breeze, soaring peacefully over Key Largo in the parasail, encounter a Dolphin on Florida Bay or snorkeling amongst the brilliant tropical fish of North America's only coral reef, our hope is that you will leave us with a smile, refreshed and recharged. Caribbean Watersports not only offers a wide variety of activities, but also helps you in creating a personalized watersports itinerary to fit your schedule and budget. Our boating activities include tours of Parasailing, Enviro-Tours, Snorkeling on the reef and Sunset Cruises. Our beach activities include rentals of WaveRunners, Hobie Cats, Kayaks, Paddle boats, and snorkel gear. Customized group activities are our specialty! Private charters available, as are our many watersports activities. Check out our new "Golden Ticket" watersports program. There's something for everyone and for all ages. Caribbean Watersports is the place to play! Off property guests warmly welcomed at the beach and beach tiki bar!